Major developments today in the ongoing fallout from the Laquan McDonald shooting case: Another police dash-cam video depicting an officer-involved shooting of a young African-American male is released to the public. But this time, the state's attorney will not bring criminal charges. This, as the U.S. Department of Justice launches a federal investigation into the police department and Mayor Rahm Emanuel announces a major shakeup at the agency that investigates police misconduct. 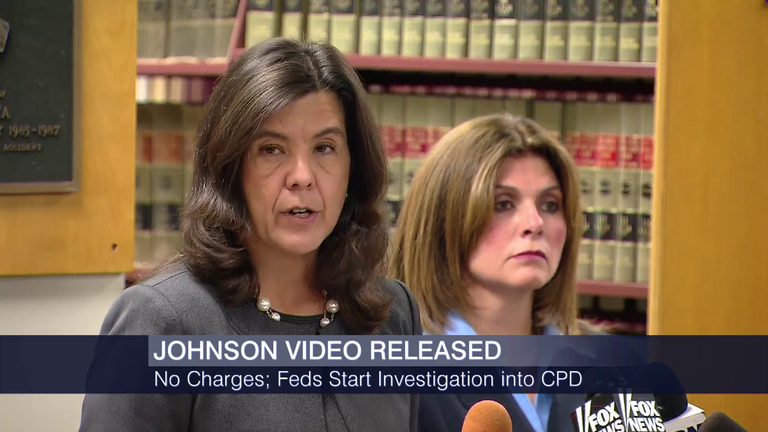 State's Attorney Anita Alvarez today announced that there is not sufficient evidence to bring charges against Officer George Hernandez after, as dash-cam video shows, he shot and killed 25-year-old Ronald Johnson. In a nearly hourlong explanation, prosecutors went over the timeline of the case: Johnson had allegedly resisted arrest multiple times, he’d allegedly knocked over a police officer and he was allegedly carrying a weapon. They also went through an exhaustive explanation of state law that they say protects the use of deadly force in this instance; that Hernandez could reasonably assume Johnson was a threat even though he was running away from him. The original video, as in the case of McDonald, does not include audio. The state’s attorney synced up audio from police dispatches to match the video. Johnson has fallen to the ground off camera as officers attend to him. Video: Chicago releases dash-cam video showing the police-involved shooting of Ronald Johnson III in October 2014. Warning: This video contains graphic images. Viewer discretion is advised. When seen in slow motion, one notices Johnson running across King Drive as Hernandez pulls up and shoots within seconds of getting out of his car. Prosecutors say Johnson was headed toward another squad car that had pulled up in the grass in Washington Park. Thus, she believes, it would be hard to prove that Hernandez wasn’t acting within the law. Johnson’s mother Dorothy Holmes and attorney Michael Oppenheimer slammed the finding today, criticizing Alvarez for relying on evidence gathered by the Independent Police Review Authority – a body under huge scrutiny whose president Scott Ando was forced to resign. Oppenheimer says that initial statements from the police union and Chicago Police Department contradict what’s in the video. “This video shows that they lied,” he said. “They said that he turned and pointed a weapon. And nobody can say that he turned or did anything of the sort. If you look at all of the evidence, if you look at the way this was handled, there is no doubt that there has been a cover-up. Fourteen months later Anita Alvarez is relying on the IPRA investigation and the head of IPRA resigned yesterday. It's a faulty organization and she did no investigation at all." Also in dispute is whether or not Johnson had a gun. Alvarez says she had forensics testing blow up the video to show an image that appears to be a gun. And she says her office did ballistics and DNA testing that definitively link the gun, which she says was loaded, to Johnson. But Johnson’s lawyer says he was unarmed and that the gun has his blood DNA, but not fingerprints, and that he thinks it was a plant. He is not asking for a federal prosecutor to take this case. On that note – the U.S. Department of Justice formally launched an investigation into the Chicago Police Department. U.S. Attorney General Loretta Lynch made the announcement today with Northern District of Illinois U.S. Attorney Zachary Fardon, whose probe into the McDonald case is ongoing. This separate investigation will be done by the DOJ’s civil rights division into the patterns and practices of the police department, looking at the entire scope of police conduct, whether there are patterns of racism, whether the use of deadly force is illegal and whether police misconduct is covered up. “Specifically, we will examine a number of issues related to the Chicago Police Department’s use of force, use of deadly force, racial and ethnic disparities in its use of force and its accountability mechanisms,” Lynch said. Video: Attorney General Lynch announces a federal investigation into the Chicago Police Department. Mayor Emanuel, who had previously thought such an investigation would be misguided, today said he would fully cooperate. Scott Ando, the former head of the agency, is out. Former federal prosecutor and assistant inspector general Sharon Fairley is in as the new chief. Also this weekend, the city revealed documents showing that the statements made from officers Jason Van Dyke and others clearly contradict what was captured on the McDonald video. Those reports were signed off on by the current interim Police Superintendent John Escalante. He was asked repeatedly whether he knew those statements were false and why he approved them even after seeing the video. “When the video was first seen, Superintendent McCarthy at the time did the most he was available to do, and had [Van Dyke] assigned to administrative duties,” Escalante said. But he left unanswered questions about whether or not officers who had falsified statements would be disciplined and whether or not they were still on duty. In a tense exchange, reporters shouted questions as he left the room with Emanuel and Fairly. The mayor will make a special address to City Council on Wednesday morning at 9 a.m., and is scheduled to be here with us tomorrow night for a lengthy one-on-one. Mayor Rahm Emanuel announces that the city will publicly release another dash-cam video showing a police officer killing an African-American male. Find all "Chicago Tonight" stories on the shooting of 17-year-old Laquan McDonald. What Questions Do You Have for Mayor Emanuel? Mayor Rahm Emanuel joins "Chicago Tonight" on Tuesday to discuss fallout from the release of the Laquan McDonald shooting video and the search for the city's next police superintendent. What questions do you have for the mayor?